Wilson To and Luis Daniel Soto are our guest bloggers today, telling you about a new industry vertical category that is being added to the AWS Marketplace.Check it out! AWS Marketplace is a managed and curated software catalog that helps customers innovate faster and reduce costs, by making it easy to discover, evaluate, procure, immediately deploy and manage 3rd party software solutions. To continue supporting our customers, we’re now adding a new industry vertical category: Healthcare & Life Sciences. This new category brings together best-of-breed software tools and solutions from our growing vendor ecosystem that have been adapted to, or built from the ground up, to serve the healthcare and life sciences industry. Allgress GetCompliant HIPAA Edition – Reduce the cost of compliance management and adherence by providing compliance professionals improved efficiency by automating the management of their compliance processes around HIPAA. ZH Healthcare BlueEHS – Deploy a customizable, ONC-certified EHR that empowers doctors to define their clinical workflows and treatment plans to enhance patient outcomes. Dicom Systems DCMSYS CloudVNA – DCMSYS Vendor Neutral Archive offers a cost-effective means of consolidating disparate imaging systems into a single repository, while providing enterprise-wide access and archiving of all medical images and other medical records. National Instruments LabVIEW – Graphical system design software that provides scientists and engineers with the tools needed to create and deploy measurement and control systems through simple yet powerful networks. NCBI Blast – Analysis tools and datasets that allow users to perform flexible sequence similarity searches. Acellera AceCloud – Innovative tools and technologies for the study of biophysical phenomena. Acellera leverages the power of AWS Cloud to enable molecular dynamics simulations. Tableau Server – Enable teams to visualize across costs, needs, and outcomes at once to make the most of resources. The solution helps hospitals identify the impact of evidence-based medicine, wellness programs, and patient engagement. TIBCO Spotfire and JasperSoft. TIBCO provides technical teams powerful data visualization, data analytics, and predictive analytics for Amazon Redshift, Amazon RDS, and popular database sources via AWS Marketplace. Qlik Sense Enterprise. Qlik enables healthcare organizations to explore clinical, financial and operational data through visual analytics to discover insights which lead to improvements in care, reduced costs and delivering higher value to patients. With more than 5,000 listings across more than 35 categories, AWS Marketplace simplifies software licensing and procurement by enabling customers to accept user agreements, choose pricing options, and automate the deployment of software and associated AWS resources with just a few clicks. AWS Marketplace also simplifies billing for customers by delivering a single invoice detailing business software and AWS resource usage on a monthly basis. Easily bring in new solutions to solve increasingly complex issues, gain quick insight into the huge amounts of data users handle. Healthcare data will be more actionable. We offer pay-as-you-go solutions that make it considerably easier and more cost-effective to ingest, store, analyze, and disseminate data. Deploy healthcare and life sciences software with 1-Click ease — then evaluate and deploy it in minutes. Users can now speed up their historically slow cycles in software procurement and implementation. Pay only for what’s consumed — and manage software costs on your AWS bill. In addition to the already secure AWS Cloud, AWS Marketplace offers industry-leading solutions to help you secure operating systems, platforms, applications and data that can integrate with existing controls in your AWS Cloud and hybrid environment. Click here to see who the current list of vendors are in our new Healthcare & Life Sciences category. 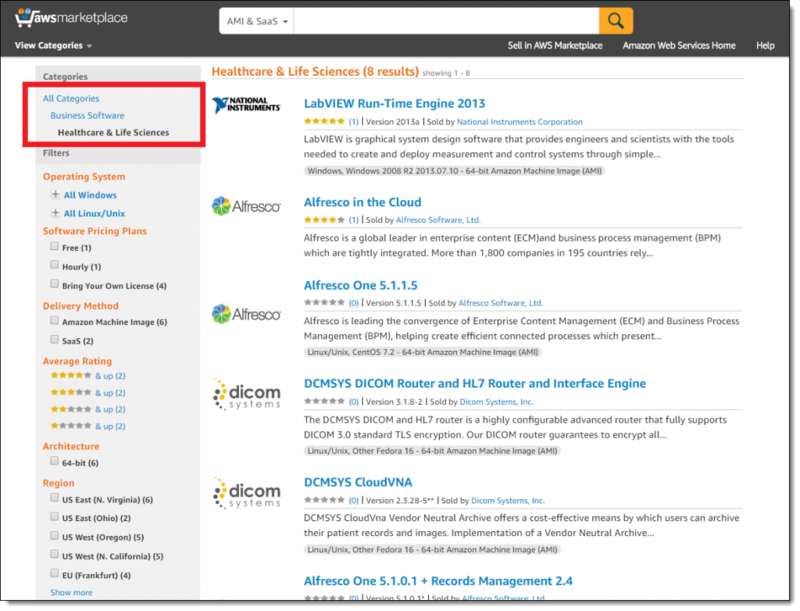 If you are a healthcare ISV and would like to list and sell your products on AWS, visit our Sell in AWS Marketplace page.